The boys will perform many popular numbers, including recognizable Christmas songs and new arrangements inspired by traditional carols. The choir has been rehearsing these pieces since August and is eager to perform them for the community. The concert is free and open to the public, while a free-will donation will be collected. Refreshments of cookies and punch will be served immediately after the concert. 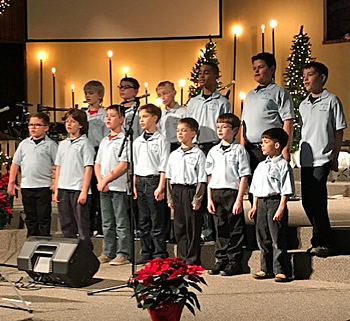 The Van Wert Area Boychoir is a non-profit organization incorporated in 2004 that is open to all Van Wert area boys in grades 3-6. The mission of the boychoir is to provide opportunities for boys of all backgrounds and abilities to participate in a quality musical, cultural, and educational experience. The boychoir rehearses on Sundays from 6-7:30 p.m. each week throughout the school year. Families with boys interested in joining can learn more by calling 419.513.0554 or 419.238.1962. The choir is directed by Phillip Winfield, with Melissa Clay as accompanist and Larry Taylor as arranger and technical director.